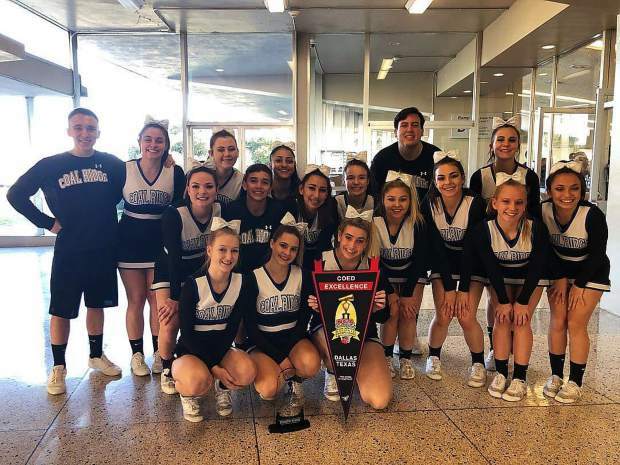 Coal Ridge High School’s co-ed cheerleading squad took fourth place in the small intermediate game performance division at the National Cheerleaders Association competition in Dallas over the weekend. Coal Ridge High School’s co-ed cheerleading squad took fourth place in its category out of 17 teams at the National Cheerleaders Association competition in Dallas over the weekend. Competing in the small intermediate game performance division, the Coal Ridge team finished behind division winner Bishop McGuinness High School from North Carolina, Soddy Daisy High School from Tennessee, and Brandeis High School from San Antonio, Texas. The Coal Ridge all-girl team also competed at the national competition Saturday and Sunday, placing eighth out of eight teams in the large intermediate game performance division.